from The Zuni Cafe Cookbook, p. 166. The warm weather is fast approaching, which means I have to get busy and make chicken stock. When the heat sets in, the last thing my house needs is a big simmering pot exuding heat throughout the bottom floor. I should, therefore, be hoarding the frozen blocks of poultry essence in the freezer, but — as she has so often in the past — Sherry drew my attention to a recipe that I had overlooked. In this one, Judy Rodgers has devised a near perfect recipe. To describe it as a near perfect blend of ingredients would be accurate but trite. I don’t know what to say that would make that less of a cliché. Nevertheless, there are one or two aspects of this soup that need practice. Otherwise, just leave it alone. ‘Tis a gift to be simple, as they say. I was tempted to add parmesan. No. Or at least, not before you’ve made 40,000 times and are sick of it. I want to make it again to figure out what wine would go with it. Rodgers recommends a riesling. I read that too late to chill one. That is the main challenge. Nothing or practically nothing goes with asparagus. 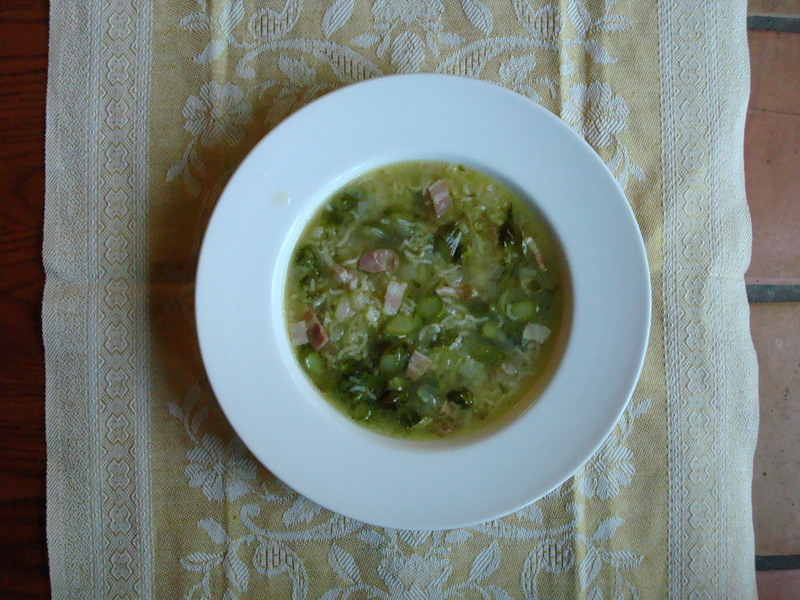 Here, the basic oeno-incompatibility is complicated by its juxtaposition with the softened onion, the pancetta, the stock… and so on. Oh, just make it and figure it out for yourself! Makes about 4 cups soup. Warm about 1/4 cup of the oil in a 4-quart saucepan over medium-low heat. Add the onions and a pinch of salt and cook slowly, stirring regularly. don’t let the onions color; they should “sweat” their moisture and then become tender and translucent in about 10 minutes. Add the rice, chicken stock, and water and bring to a simmer. Cover tightly and cook until the rice in nutty-tender, probably 15 to 20 minutes, depending on the rice you choose. The broth will be cloudy and should taste sweet from the onions. Turn off the heat. While the rice is cooking, sliver the asparagus, slicing it on an angle about 1/3 inch thick. Don’t worry if th eslivers vary a little in thickness; the irregularity will guarantee uneven cooking and a pleasantly varied texture. You should get about 2 cups. Warm the remaining 2 Tbl oil in a 12-inch skillet over medium heat. Add the pancetta and asparagus slivers and stir once to coat, then spread them out and leave to sizzle utnil those at the edges of the pan begin to color. Toss or stir once, then leave to color again. Repeat a few time until the mass has softened and shrunk by about one-third. Scrape the pancetta and asparagus into the broth and bring to a boil. Add lots of pepper. Boil for about 1 minute. This soup is best when served promptly, while all the flavors are still bold and the texture varied. My response: Amen to that! Nothing I’m about to say here should be taken as a corrective. I don’t even mean my suggestions as an enhancement. I merely want to relay my experience. I prepared all the ingredients at once, ahead of schedule. As usual, I used kosher salt. Basmati rice was all I had on hand, but I won’t use that again. I want something a tad firmer. When it came time to tip — as Nigel would say — the pancetta and asparagus into the pan, Michael Chiarello’s wise words came back to me. Just let it all sit and crisp up. If you adjust the high not too high and not too low, you shouldn’t have to touch it for at least five minutes. Stirring is what mucks up the crisping endeavor. Even I, after all the advice I’ve given myself, tend to stir too early. In this instance, it turned out fine. But don’t stir until you absolutely feel you have to. I would not stir the asparagus and pancetta around more than three times. Black pepper, yes. But I sneezed and choked a little on the amount I grated over it. I must find the proper amount. Fat is vastly underrated. Fat is savory-sweet. You have to render the fat of the pancetta in order to understand how all the ingredients come together. How simple can a soup get? Sally, I’ve now made this twice. The first time I made it — when you came to dinner — it came out better than my second attempt. Here’s what I learned: arborio rice works better than basmati but be careful not to overcook it like I did on my 2nd go (in fact, if you want it to have a bit of bite, then slightly undercook), and using the larger quantity of pancetta works well and will not overwhelm the soup, as I was afraid it would when I first made it. The fat and salt TASTE GOOD! This soup does not age well. I ate it for the next couple of days but I wouldn’t serve it to guests that way. Boy, that’s a timely post! I just bought the ingredients for another batch tonight or tomorrow. The arborio is a great idea. I’ll make that change. I’m going to try a new recipe, celeriac and crabmeat, from the Patricia Wells book. Now that I’m thinking about it, I’m trying to figure out if there’s a way to prepare the soup base with the onion and the pancetta, but not the rice and asparagus. That way, I’d be able to make only as much as I need for dinner and save the rest for the next day. While the asparagus are sauteing, I’d simmer the rice in the soup base until it’s cooked. I suppose you could cook the onion in the broth first and add the rice later. It’d be interesting to to see if anything is lost by making that 2 steps instead of one. Personally I think sauteing the asparagus with the pancetta might turn out to be important; that fat probably does something for the asparagus that would be missing if you just added it later.